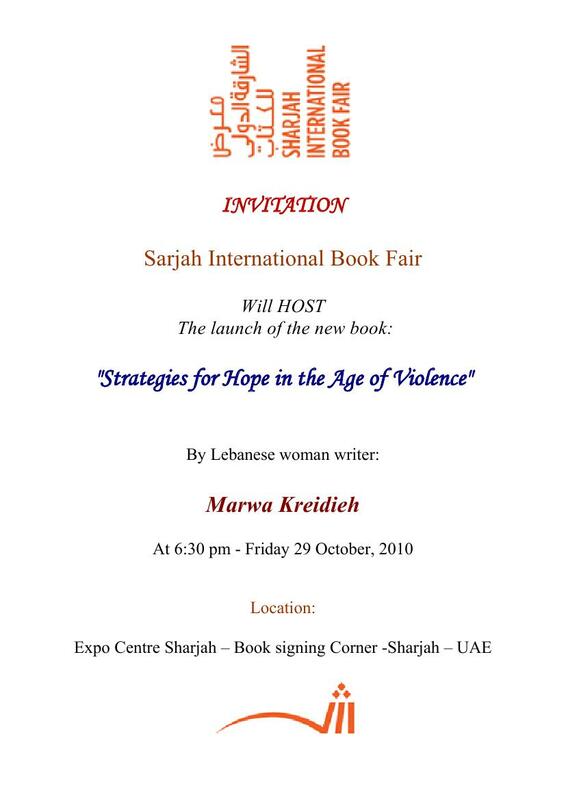 Sharjah international book fair 2010, will host young Lebanese woman writer Marwa Kreidieh on the occasion of the launching of the new book: « Strategies for hope in the age of violence » At 6:30 pm next Friday, 29, October 2010 in The Book-signing Corner at Intellectual Programs Hall, Expo Centre. The new book reflects the author’s deep anxieties about the present and it reflects her interest in the field of sociology and its relationship to humanitarian activities. In her book, the author covers the opinions of the wise men and then links that to politics, economy, media and environment. By doing so, she seeks to provide a general outlook for those who want to go beyond the reality of violence to a different horizon than those that have been captivated by power, violent content and the hustle of misleading media. The author has tried attaining her purpose by replacing, the current low perception of man, culture and identity that reduces the multi-facet of humans, into portraying the human being as a peaceful creature through presenting a contemporary image based on spiritual dimension mingled with heritage. Marwa’s work revolve around two key principles: the first presents the issue of violence and questions its meaning, its boundaries, and its manifestations in politics, media and economy; while the second tries to attribute reasons for violence to the division of the human thought affected by the bilateral violent impotent logic. Marwa Kreidieh, a strong opponent of violence in all its forms and ideological moorings, has said her book, » is an attempt at questioning the received wisdom on different aspects of life in our times, including religion and culture. The book, published by The Al NAYA Foundation for Research and Publishing, Damascus, is a collection of creative writings that defy easy categorization. Her books: Rebellious Ideas: On Thought, Culture and Politics, Passages of the soul, Thinking on Paper – Criticism, Thoughts from the remnants of memory. When we connect with the Earth, we are connecting with the body of the living Goddess, so that Her energies are made available to us, travel through us, envelope us, and heal us. It is important that we not use our own personal energy, so as not to become depleted.